"Silver Bullets" / Protected by "Plagiarism Detector" logo on your website. For many reasons you may want to tell your visitors that the content of your site is monitored by Plagiarism Detector. If you need any banner design adjustments\changes (size, color etc.) - feel free to contact us - we will promptly prepare a better variant for your needs! 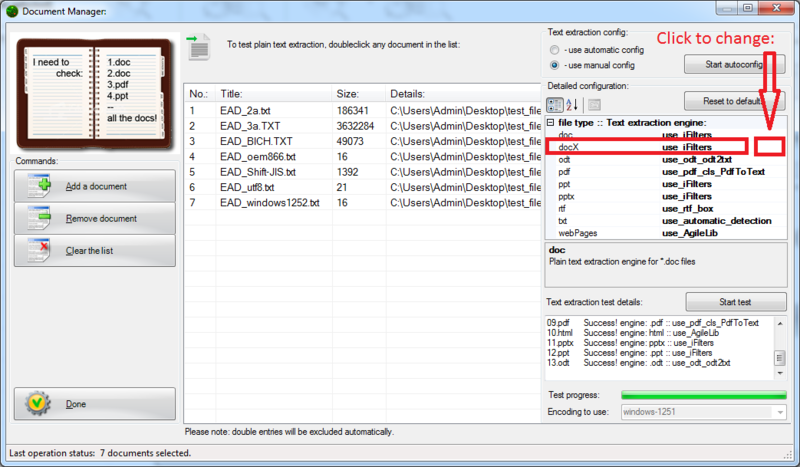 RDP session is supported only in Plagiarism Detector Pro. But you need to manually configure PD to work correctly during RDP logoff. You need to set: b_IgnoreSessionChange parameter to TRUE. Otherwise Plagiarism Detector will terminate on RDP session disconnect. "Silver Bullets" / Avoiding "Resource Processing Timeouts" error. "Silver Bullets" / What is PDAS? This section explains what is PDAS. This sections explains what Plagiarism check types are supported by Plagiarism Detector and their scope. 2. Database Check (PDAS) (1 to very large amount of huge documents up to millions). 3. Check 2 Documents against each other. 4. Check against Local Folder Check (1 to many up to thousands of documents). 5. Hybrid Check [Internet + PDAS Database]. It runs a check against 2 major search engines: Google and Bing. a) "If it is on the internet - it will be probably detected". b) If it is not in the search index - it will not be detected. c) If it is in the search index - Plagiarism Detector can still miss it (bad things happen too). - Bad search engine SERP relevancy (Recall\Precision). 2. Database Check (PDAS = Plagiarism Detector Accumulator Server). PDAS is a separately sold product that integrates with Plagiarism Detector Client programs. Plagiarism Detector - is a Client program. PDAS - Plagiarism Detector Accumulator Server - is a Server database. 1. You need to have a special need for this :-). You need to have a corpus of documents or a little library. 2. You need to download PDAS (free demo is available). 3. You need to install PDAS. 4. You need to import your corpus of documents or a little library into PDAS. This requires some time and effort. 5. At this point you will be able to run checks against your brand new PDAS Database. 6. Start the client (any Plagiarism Detector), it will detect PDAS instance and you are ready to go! 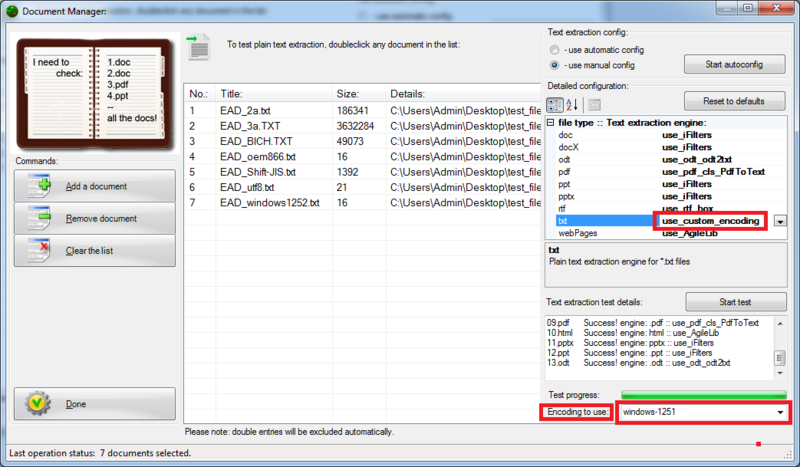 via the Document Manager, and the second one - you need to select at the last step of the New Check Wizard. 4. Check against Local Folder Check. figure out if there is cross-plagiarism in between. This is the right place to start! step of the New Check Wizard. 5. Hybrid Check is in development atm. "Silver Bullets" / What is "Use Last Session"\"Manually add Documents"? + most important: increased Plagiarism Detection sensitivity. We used a number of manually-rewritten documents to get the most optimal detection behavior. 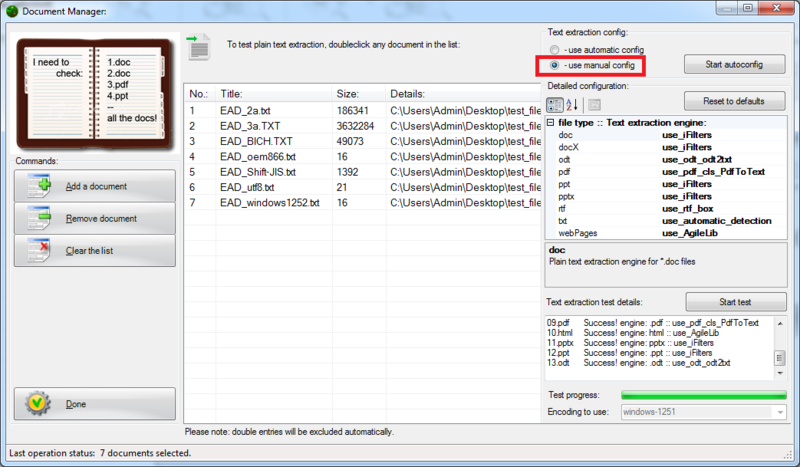 + default session option is reseted to "manually adding documents" at program restart. + large number of reports is now displayed with progress bar indicating their loading process. + filters in Report Viewer are reseted at form open stage. Thus fixed bug with incorrect Originality Report loading on active filters. + added more "Content-Types" to avoid resource processing due UnsupportedContentType error. + added "what's new in the update" - to the auto-update system linking to this board. provided files with rewritten sections - that helped us greatly to configure the new version! 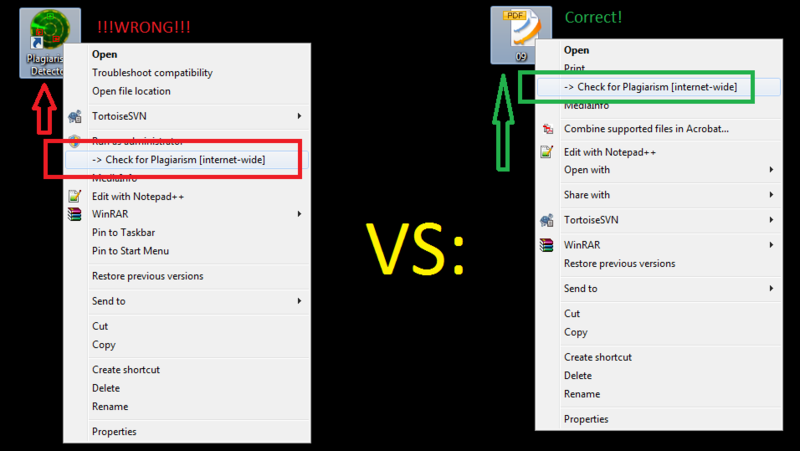 + Added "Wrong File" warning screen for better explanation on how to work with Shell Context Menu. + Second screen modal bug fixed. + Added "Blue Help Buttons" linking to the related Community Forum threads. + Core Version is now hard-coded into the main executable. + Better support for "File in use" issue. Tested with "Read non-exclusive Lock" and "Write-Read exclusive Lock". "Silver Bullets" / Wrong File warning! Dear client, you are doing it wrong! Your target file is usually a Microsoft Word of PDF Document. So you need to use the CONTEXT menu on that file, and NOT the Link of the Plagiarism Detector! 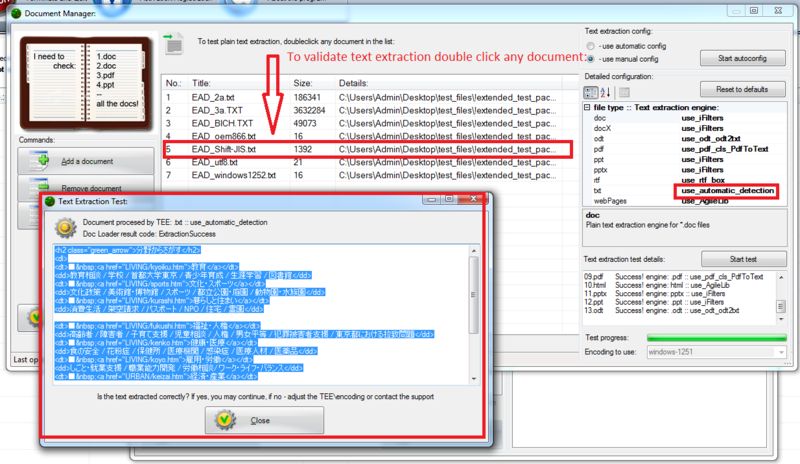 Plagiarism Detector has several methods of Extracting Plain text from each supported file type. For each file type has it's own Text Extraction Engines. Text Extraction Engine (TEE) is a sub-program that extracts text from a specified file type. By default, every time you start Document Manager - Plagiarism Detector automatically selects the most optimal TEE for each supported file type. Incomplete Text Extraction (some parts of the document are missing). Dirty Text Extraction (when html code is present in the document). Wrong encoding detection for complex file formats. TEEs configuration made with Document Manager is global - it is used in all cases. TEEs configuration made with Advanced Report Viewer (ARV) is local - it is used only within ARV session and then reseted to global setting. Plagiarism Detector tries to correctly detect and use the correct encoding for every loaded document. But sometimes it may detect wrong encoding. To avoid this situation you need to tell Plagiarism Detector which encoding to use. Select the Documents to check. Before changing ANY values you must click the following, otherwise changes does not take place! Q - How to make sure that the encoding is correctly chosen? A - Double click any document in Document Selector and you will see what the text will look like.